Help: how to paint snow covered branches in deciduous trees from old photo? I need a little bit of assistance in my current project. Below is a photograph of my great grandmother's 1905 birth place. My family already had one artist do an oil painting based on this photo and they want me to try a watercolor. My preliminary watercolor is below. I can do much better than this, obviously but am stuck with which colors to use - do I give the chimney more color, paint the stream blue or leave it all with the sepia feel? In the sketch painting I did I used sepia, Naples yellow, dioxizine violet and some dip pen in undiluted India ink. I really like the way dip pen can pull a painting together. I also used white dip pen paint to try to cover the snow covered branches and am mildly happy with the results. I need a better system to capture the mood of snow covered everything. Do I need to mask off all the branches and boards and then come back after washes to fill in what I want and leave the rest white? What colors would you use to bring this painting to life? How would you attack this project. Please remember I only started drawing/painting at all late December 2014. I have taken hours and hours and hours of lessons her so do understand a lot just might not be able to pull it off. Thank so much for reading and please feel free to post any ideas. I'm trying to get the pics to work. 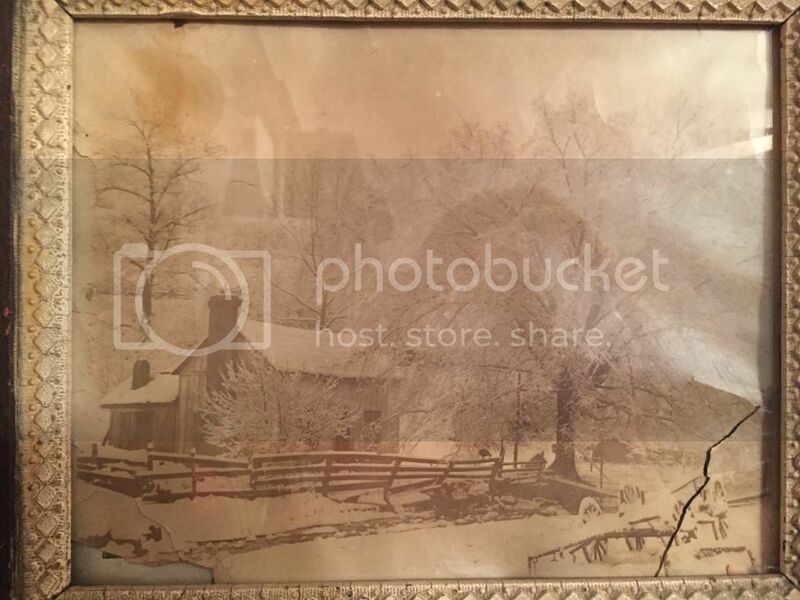 Re: Help: how to paint snow covered branches in deciduous trees from old photo? Would love to see these, Elizabeth, but I cannot open your images. Have you posted them in your gallery first? Do that, and then copy the smg code I to your post. Seeing if this works: Ok the first is the house, the second is the paint sketch I made as mentioned above. Okay, I can see them now. Personally, I wouldn't be afraid to use color. You could mask the trees, roof, fence to preserve the whites, or carefully paint around those areas. If you find you need more white later on, you can use white gouache. The stream will, of course, reflect the sky color.shados on the snow should be blue or pale grey. 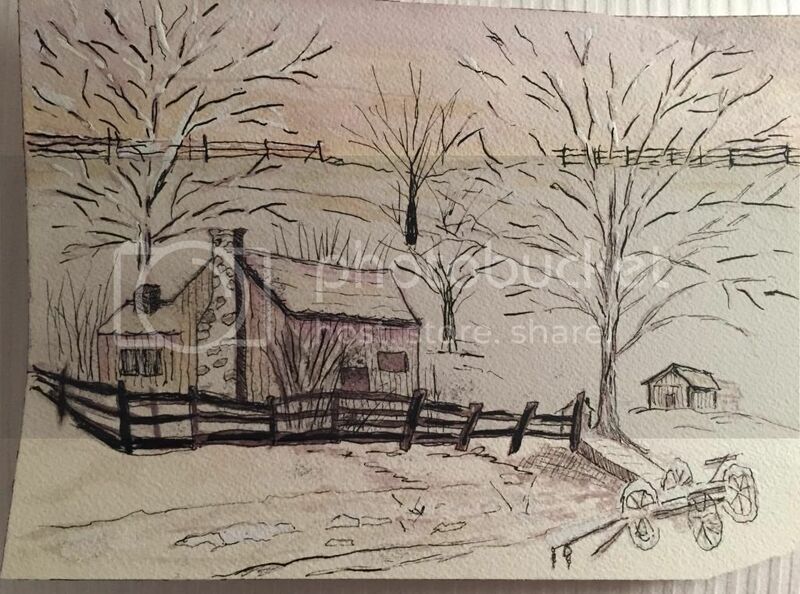 You may find it helpful to look at paintings of snow scenes here (check out Dennis's class on painting a cottage in the snow) and on other sites to see how other artists handle snow scenes. Thank you so much, Susan. I am reviewing Dennis' winter trees lesson already and it has helped me a lot so far! Definitely getting my game plan together to give it another try tomorrow. It's difficult when you switch from following along to figuring it out yourself. I know striking out on your own can be scary. Just tell yourself that it's only paint and pigment, and everything is a learning experience. If it feels irretrievable, you can start over again. I can't tell you how many times I have done that! Have fun, Elizabeth!